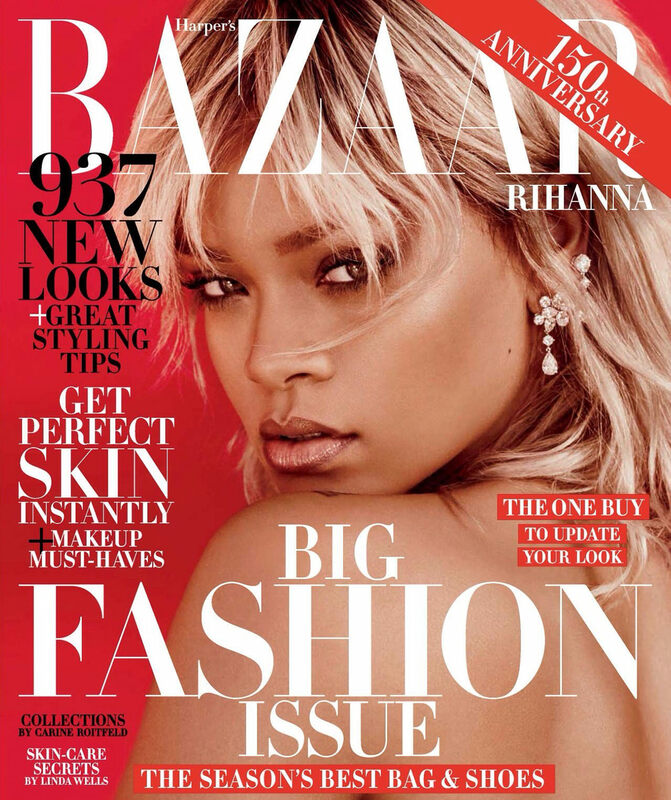 It’s so good to see Rihanna on the cover of a magazine again! She fronts Harper’s Bazaar‘s March 2017 issue, which is also the magazine’s 150th anniversary issue. The cover and editorial are a tribute to the great Amelia Earhart and the photos are absolutely beautiful. Late last year Rihanna sported short blonde hair in her friends’ Instagram photos. That was the day she shot for this cover. Mel Ottenberg styled the shoot (he remains the best) while Mariano Vivanco was the photographer. On the cover she wears diamond earrings by Chopard. First we have this stunning shot of the superstar on top of a plane. 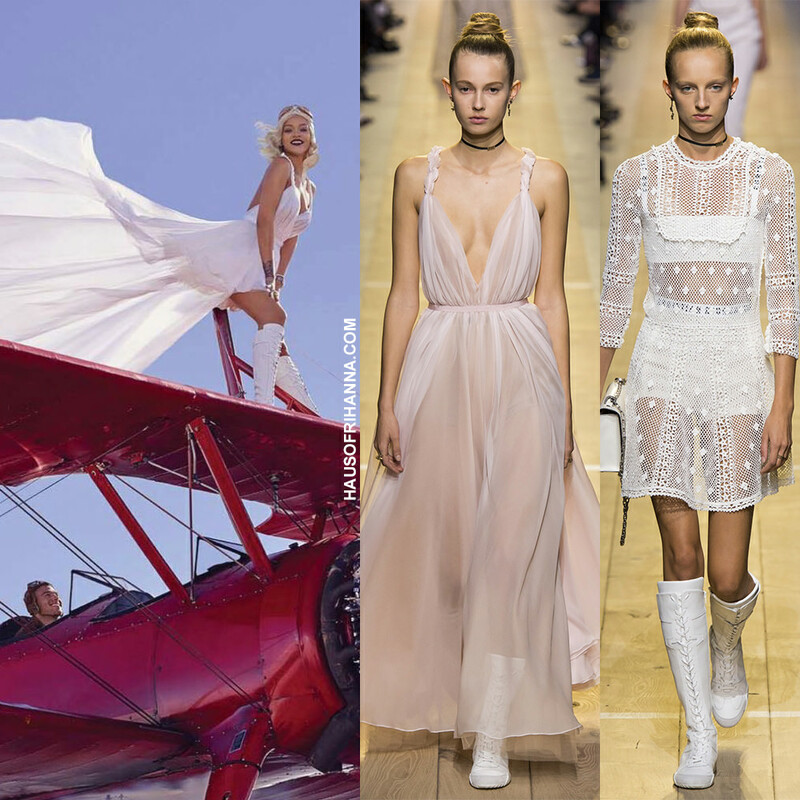 She has a Marilyn Monroe moment in a Dior Haute Couture halter dress (pictured is a similar dress from the Spring 2017 collection) and a pair of Spring ’17 knee-high sneaker boots. The flight hat is vintage Ralph Lauren and the jewelry and watch are Chopard. The goggles are also vintage. 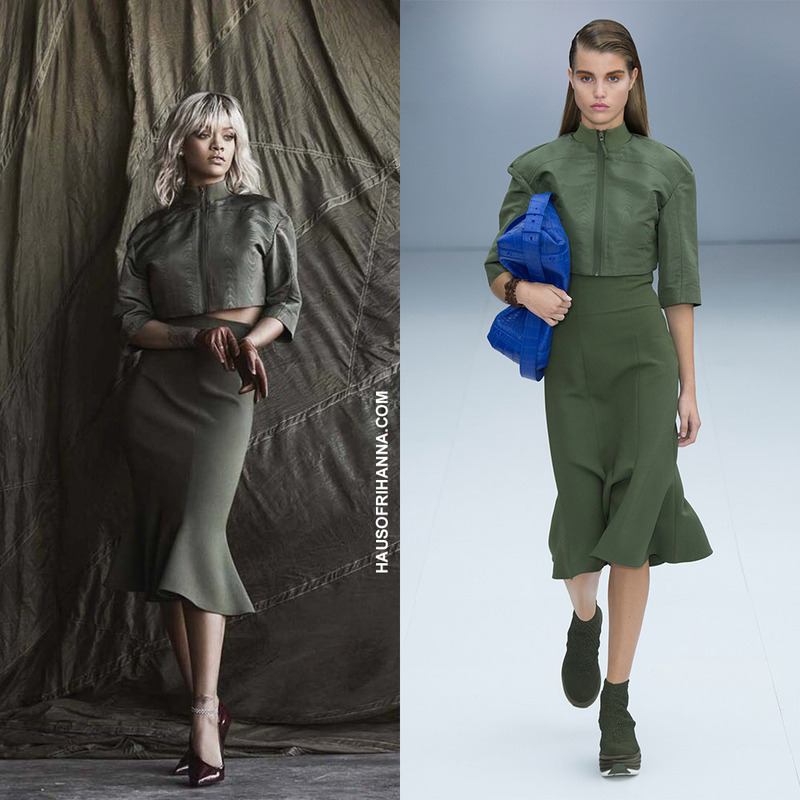 Here Rihanna poses in a green top and skirt from Salvatore Ferragamo‘s Spring 2017 collection [Look 6]. 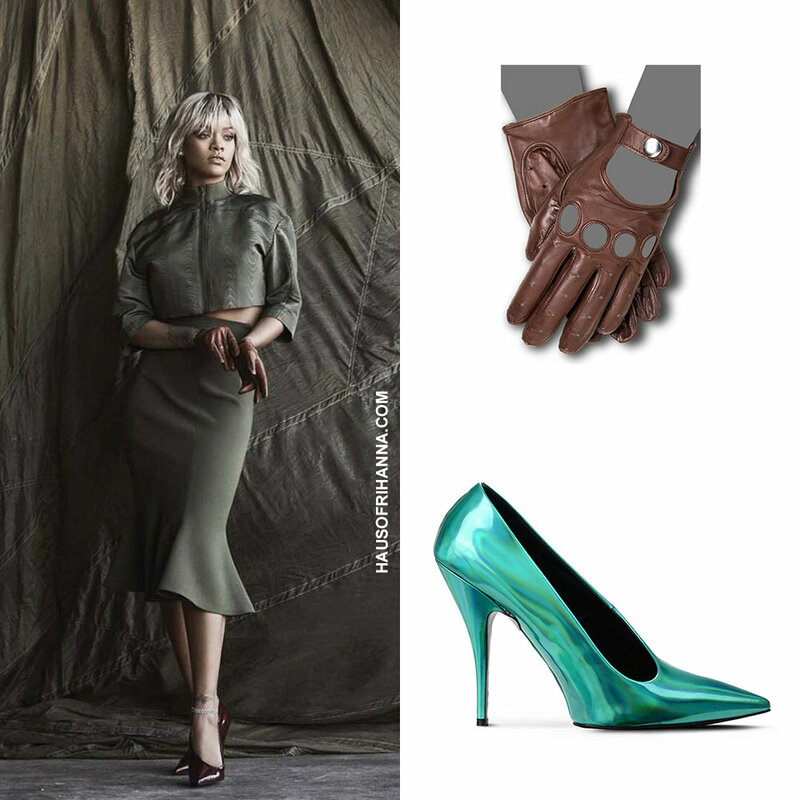 Earrings by Chopard and ankle bracelet by Jacob & Co.
She also wears leather driving gloves ($290) by Gaspar Gloves and pointed toe pumps (pictured in blue) from Stella McCartney‘s Spring 2017 collection [Look 24]. You can pre-order the steel blue or white versions for $725. 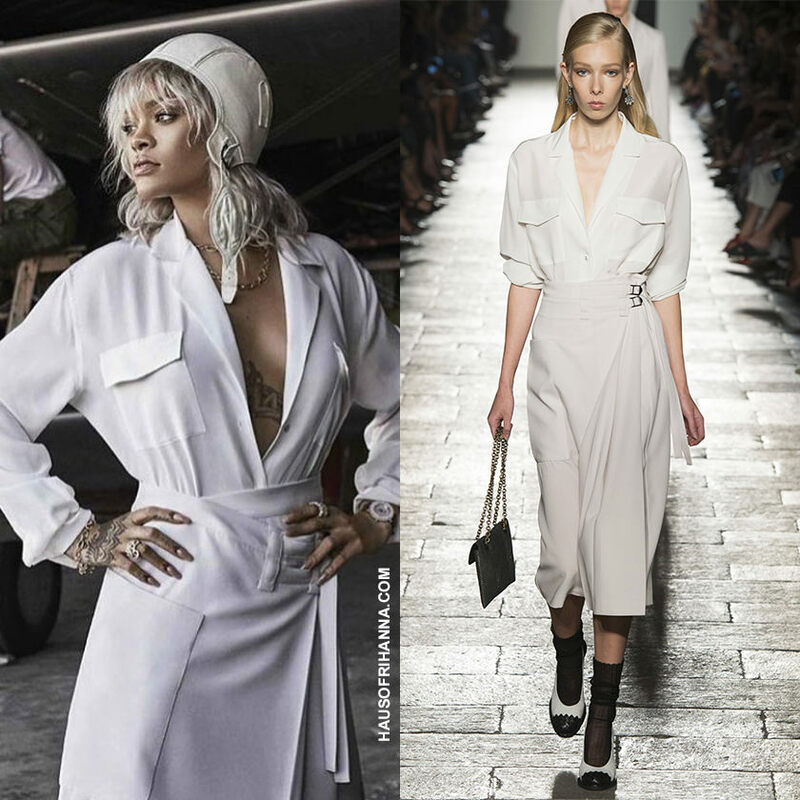 Next we have Rihanna in a white shirt and wrap skirt from Bottega Veneta‘s Spring 2017 collection [Look 38]. Again she wears the vintage hat from Ralph Lauren. Necklace and watch by Chopard, rings by Dior and bracelet by Cartier. 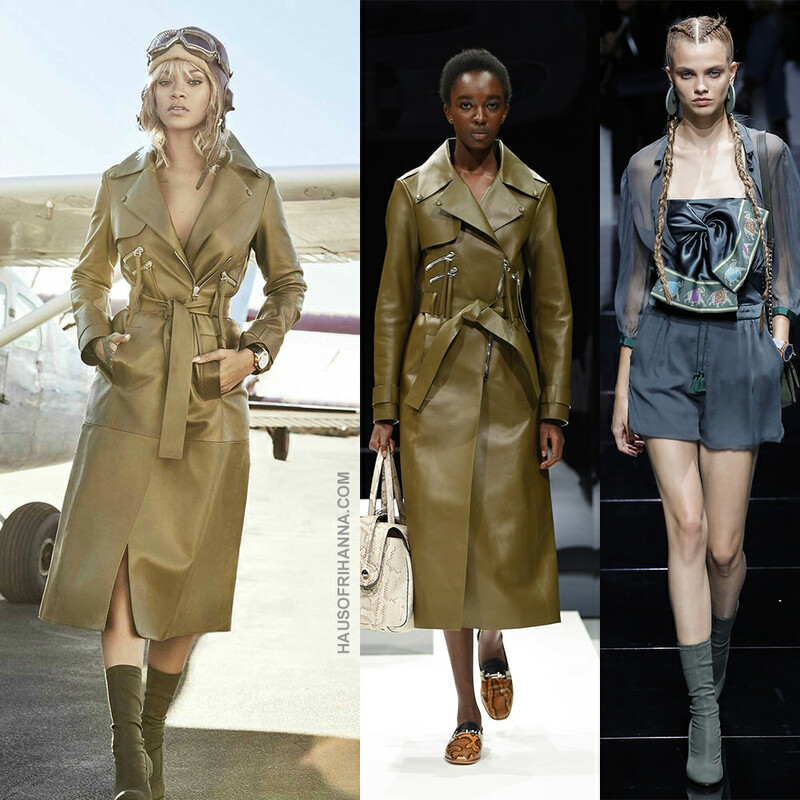 Rihanna takes a stroll in Tod’s Spring 2017 green leather coat [Look 20], Emporio Armani SS17 sock boots, and a Jaeger-LeCoultre watch. The hat and goggles are vintage. 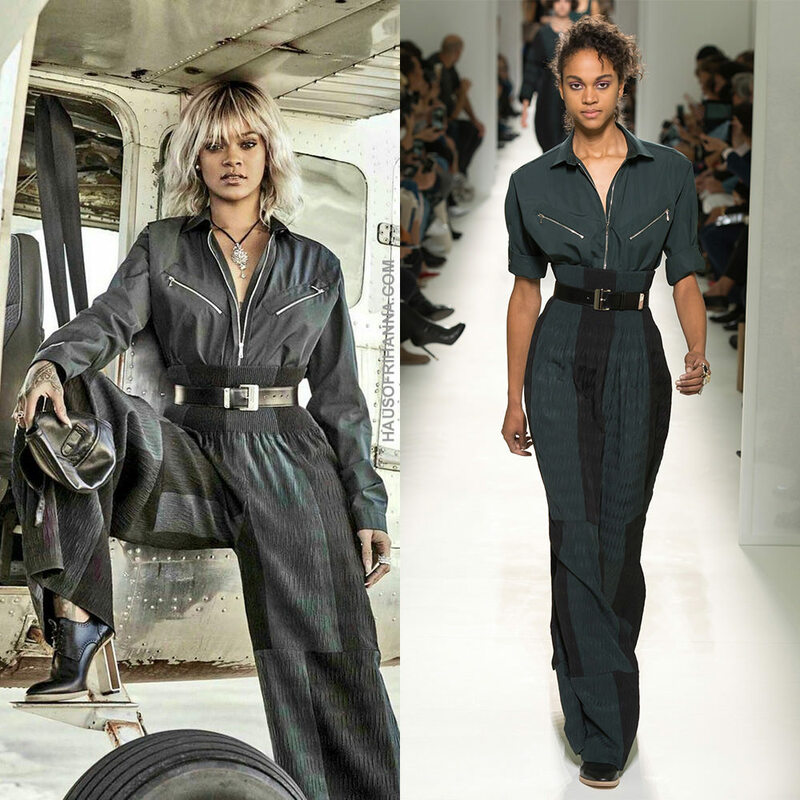 Rihanna is a fly girl in Hermès Spring 2017 shirt, pants, belt and shoes [Look 35]. Necklace and rings by Dior and earrings by Chopard. Vintage hat. Riri with her squad. She wears Look 1 from Stella McCartney‘s Spring 2017 collecton. This comprises a white jacket with a corseted waist and loose-fitting trousers with a paper bag waist. She also sports a pair of Hermès shoes mentioned earlier along with the Jaeger-LeCoultre watch and Ray-Ban aviator sunglasses. Purchase the classic shades here ($150). 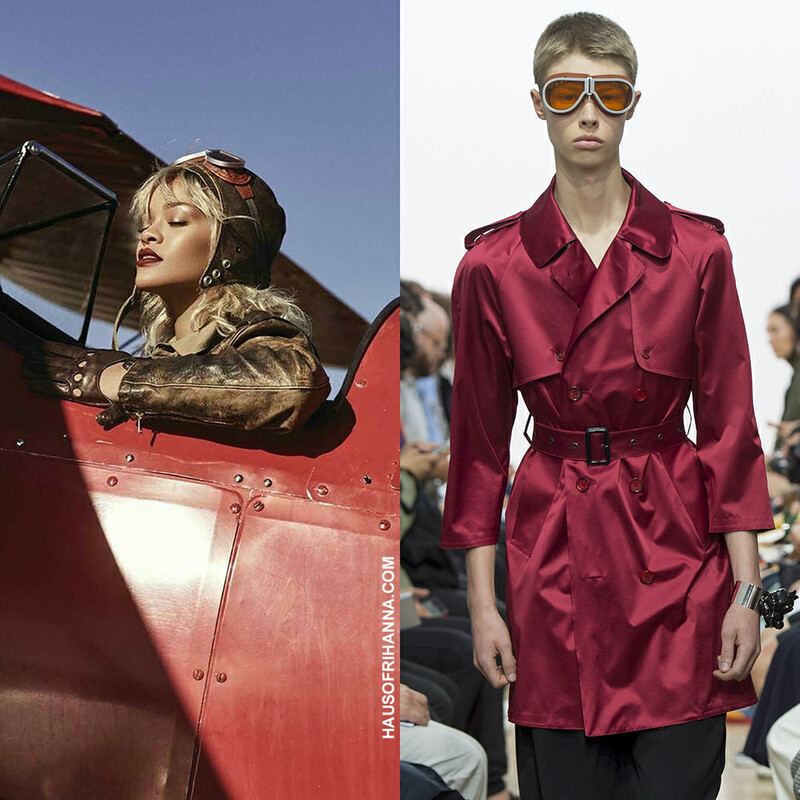 Rihanna takes to the cockpit in J.W.Anderson Spring 2017 menswear goggles along with a Ralph Lauren jumpsuit and leather jacket (more on that below). The hat is vintage and these are the same Gaspar gloves mentioned above. 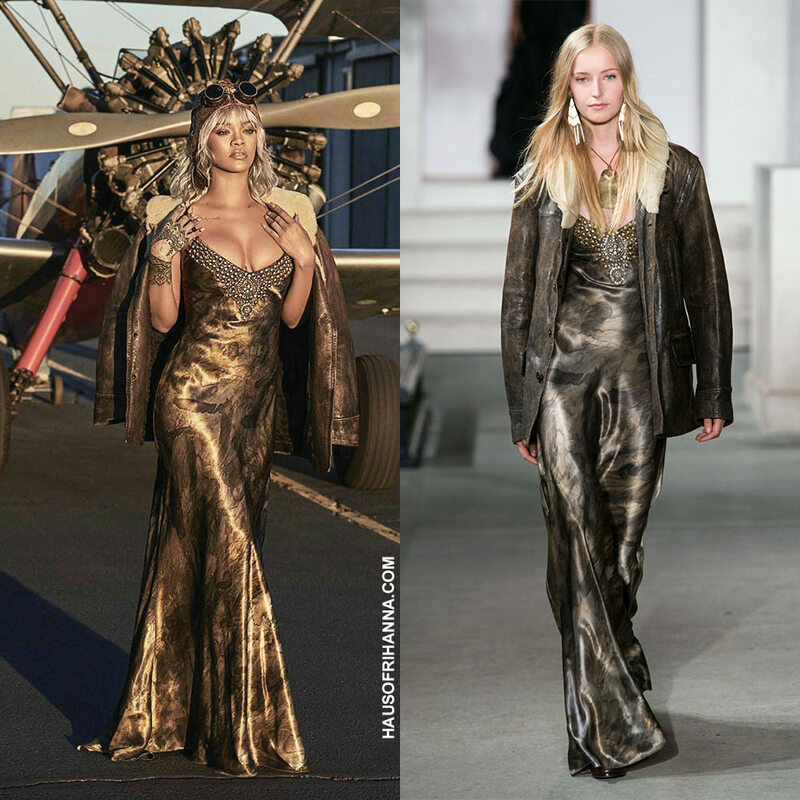 Finally, the Bajan beauty looks stunning in a leather jacket and metallic dress with embellished neckline. Both are from Ralph Lauren‘s Spring 2017 collection [Look 13]. Update: There’s actually one more look. 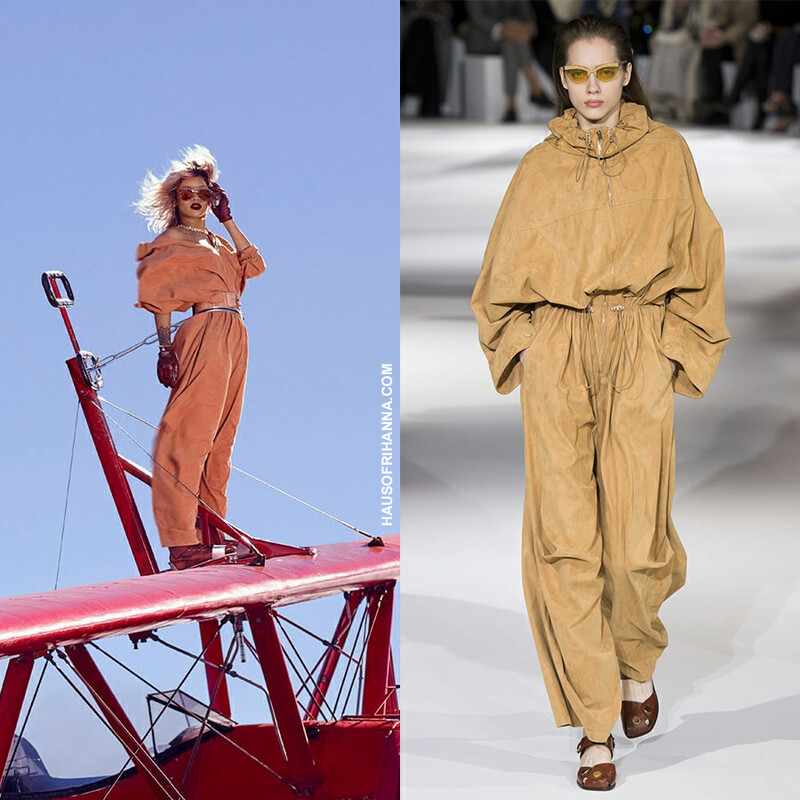 Rihanna wore a Stella McCartney Spring 2017 jumpsuit [Look 7], a Ralph Lauren belt, J.W.Anderson boots and Louis Vuitton sunglasses. Gloves by Gaspar and jewellery by Cartier.